- Asuka vs. Nia Jax has been announced for next Monday's RAW in a rematch from the Elimination Chamber pay-per-view. - Tonight's WWE RAW saw Bayley snub Sasha Banks during the six-woman tag that opened the show. There's been speculation on Banks vs. Bayley taking place at WrestleMania 34. Below is post-RAW video of Mike Rome asking Bayley about the snub. She says she has her reasons and that's it. 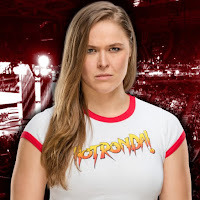 - Ronda Rousey and Stephanie McMahon appear to be on good terms, but Triple H certainly didn’t help matters as he sucker punched Kurt Angle on RAW. Rousey made her first appearance on WWE RAW tonight in a segment advertised as a ‘peace summit’ of sorts. HHH and Stephanie came to the ring and Stephanie explained her side of things, and said she understands why Ronda acted out. She said she herself acted out because HHH got put through a table, then she asked Kurt Angle to come out and apologize for stirring things up. Instead, Rousey made a bee-line for the ring as Angle tried to stop her, then he talked her down and said they have to do things differently here. Angle ended up apologizing and said he lied about what HHH and Stephanie said, then they all said their peace and tried to leave. Rousey said they weren’t done just yet, saying Stephanie still needed to explain herself for slapping her, saying that’s never happened before. Rousey said Stephanie could also apologize… or she’d rip her arm off. Stephanie ended up apologizing quickly, then the couple went to leave, but HHH dropped Angle with a punch and could be seen cursing him out as Rousey checked on him at the end of the show.